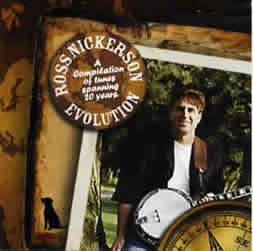 Here is is the latest release from Ross Nickerson. 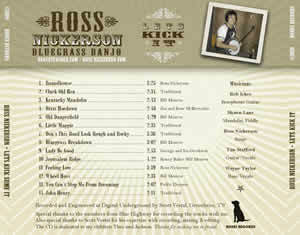 Accompanying Ross’ hard-driving, blue-grass banjo are four members of the critically acclaimed bluegrass band, Blue Highway, Rob Ickes on dobro, Tim Stafford, guitar and vocal, Shawn Lane mandolin and fiddle and Wayne Taylor, bass and vocals. The CD was recorded and engineered in Nashville by banjo great Scott Vestal and features fast tempos, explosive solos and some great new bluegrass music. Straight ahead banjo playing featuring banjo playier Ross Nickerson with four members of one of the best bluegrass bands in the business, Blue Highway. Features: Rob Ickes, Dobro, Shawn Lane, Mandolin/Fiddle, Tim Stafford, Guitar/Vocals and Wayne Taylor, Bass/Vocals. 14 songs in all. Including: Foggy Mountain Breakdown, Stairway to Heaven, Under the Double Eagle, El Cumbanchero, Ghost Riders in the Sky, Train 45, I'll Fly Away, John Henry and more. Free tab for Stairway to Heaven as played on the CD with purchase. Songs included are: El Cumbanchero, San Antonio Rose, Garcia, Panhandle Rag, Ghost Riders in the Sky, Texas Blues, Red River Valley, Lonesome Cowboy, Jesse James, Don't Fence Me In, Standing Eagle, and Streets of Laredo. Free tab for El Cumbanchero as played on the CD with purchase. Many great Chrismas songs done in the bluegrass style like you've never heard before! Free tab for Oh Come All Ye Faithful as played on the CD with purchase. 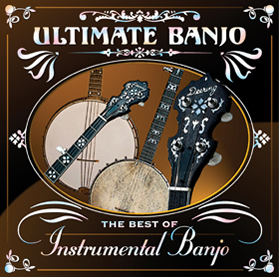 Ultimate Banjo is a 20 track instrumental compilation, and showcases the fast, hard-driving, three-finger bluegrass style. In addition to focusing on the sound of the banjo, Pinecastle also wanted to take the opportunity to encourage knowledge about the history of the instrument. Greg Cahill, Chairman of the Board and President of the International Bluegrass Music Association (IBMA) and banjo player for Special Consensus, with his extensive knowledge on the matter, was able to compose detailed liner-notes on the musical evolution of the banjo. This is a good collection for both the banjo curious and banjo aficionado. Free tab for Jesse James as played on the CD with purchase.